Owning real estate in the Cayman Islands is easy and straightforward and unlike other islands in the Caribbean, the Cayman Islands welcomes foreign ownership. And, the presence of a robust real estate brokers association ensures that the transferring of property – whether you are buying or selling – follows globally recognized industry standards. Taking up residence in the Cayman Islands is an exciting adventure for anyone and buying a home to call your own makes moving to the Cayman Islands a more personalized experience. Investing in island real estate lets you bring your home with you when you start a business here or take up a job in Cayman. The advantages to owning your own property are numerous and real estate in the Cayman Islands has long been a smart investment and the market continues to see increases in sales and investment returns. Best of all, there are no property taxes in the Cayman Islands. As a tax-free jurisdiction, the Cayman Islands also imposes no capital gains tax, inheritance tax, sales or withholding taxes. Working with a certified member of the Cayman Islands Real Estate Brokers Association (CIREBA) gives you immediate access to a wide range of Cayman Islands residential properties including condos on world-famous Seven Mile Beach. The Multi-Listing Service (MLS) operated by CIREBA contains the most up-to-date listings and makes it easy for you and your real estate agent to navigate the many types of properties available in the Cayman Islands. Condos in the Seven Mile Beach corridor are understandably popular and are good financial investments as well. Seven Mile Beach properties range from beach-front properties to stand-alone houses in quiet residential neighborhoods. Condos and homes in this area are typically 2-3 bedrooms and 2-3 baths, most with swimming pools. Other neighborhoods nearby the commercial heart of Grand Cayman feature spacious family homes on large lots along tree-lined streets. The process for purchasing a home is straightforward. You will work with your real estate agent to identify the property that best suits your needs and after writing an offer to purchase on the property, the homeowner may respond with a counter-offer. Once the selling price has been agreed by both the seller and purchaser, the purchaser pays a deposit and the real estate agent draws up all the necessary paperwork in preparation for closing. Your real estate agent will recommend home inspection companies, mortgage lenders and legal services to finalize the transaction. A modest stamp duty on the sales price of the property is paid at closing. CIREBA monitors member transactions ensuring that property transfers maintain a high level of ethical standards. 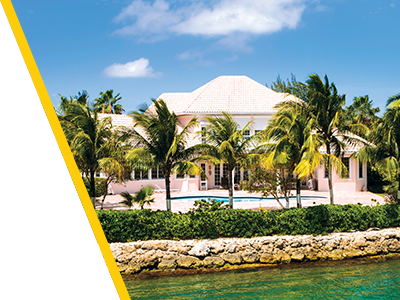 CIREBA has been setting exacting standards for the real estate industry in the Cayman Islands for over 25 years. Member agents receive extensive and continual training. Working with a CIREBA agent gives you peace of mind about the integrity of the purchase process. Owning property in the Cayman Islands is a rewarding experience for those planning to call Cayman home. Cayman Enterprise City is proud to partner with Trident Properties (Cayman Islands) Ltd to help our clients with purchasing or renting residential property. The team of professionals at Trident Properties Ltd has many years of experience in the local Cayman Islands real estate market and can guide you to finding a home that meets your requirements. Trident Properties is a proud member of CIREBA and has already helped many incoming CEC personnel relocate by assisting with their real estate needs. Contact Kerri Kanuga on Kerri@tridentproperties.ky or call +1-345-916-7020 or drop by their offices in the CEC office building on 68 West Bay Road to find out how you can begin the process of acquiring property in your new home.